I originally wrote this post for the MITX blog as part of their UX and Design series. It can be found here. It’s a familiar situation: You enter a department store, shopping for a shirt (a pair of shoes, pants, jewelry, etc.). As you walk through the front door a sales associate approaches, perfume tester in hand, sprays you as you dodge out of the way and asks if you’d like to learn more about the perfume. “No!” you say gruffly, dismissing the associate and continuing on to your department. A user navigates to a clothing retailer’s website to buy a shirt. After the page loads, a pop-up takes over the entire screen asking the user to sign-up for their newsletter. Just enter your email address and you’ll never miss out on future deals and promotions. As digital marketers we are focused on customer engagement. We measure this by the number of touchpoints we create. How many times a user interacts with our brand through our website, email, mobile app, or in-store. The bigger the number, the more we are engaging our customers. Right? Or, are we using the wrong metric altogether? Are we asking the wrong question? Are all touchpoints not equal? I should note that the newsletter pop-up tactic is employed because it’s been proven to work (we’ve seen anecdotal evidence that it leads to increased sign-up). It is technically a “win” for the brand. But out of this experience, what does the consumer get? What seems to be missing from the equation (touchpoints equal engagement) is the value for consumers. Consumers are certainly willing to provide their personal email if there’s a commensurate (or greater) return value. 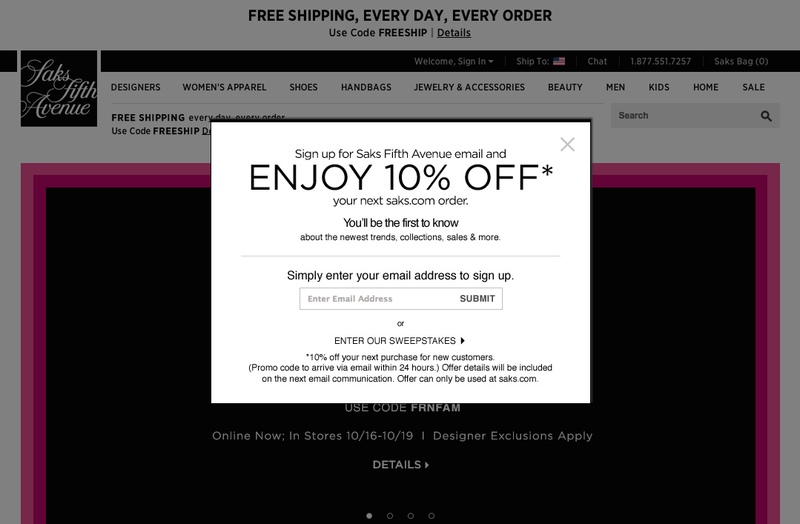 Sites like Rue La La and Gilt — which sell discounted luxury brand products — require an email for access. Users sign-up because they are receiving something worth handing over their email: a big discount on coveted items. Look at how Starbucks creates value for the customer in exchange for engaging with their brand: Signing up for Starbucks’ loyalty program allows customers to link any gift cards they receive to their account. This, in turn, allows them to transfer balances among those cards. The immediate value to the user is that they no longer have to juggle multiple cards with small balances. Additional value is provided when customers use the Starbucks app, allowing them to throw out the cards and pay by phone. And every 12 beverage purchases is rewarded with a free drink. It’s is meaningful engagement for coffee drinkers. Customers receive real value via simplified purchasing and free drinks. Starbucks receives real value via repeat customers. Starbucks has improved the experience for their users and in return receive more loyal customers. It seems obvious that creating great customer touchpoints requires value for both sides (users and brands). To create meaningful engagement, digital marketers should not just think of new touchpoints to create — and consider all interactions equal — but rather focus first on the value for the user. We should prioritize what we can provide users in the way of convenience and true help (as opposed to marketing emails). Starting here will help us build better customer touchpoints and ultimately result in more positive interactions between consumer and brand.